Sorry, folks. My hopes are officially up. After a well-executed but non-flashy premiere last week, The Walking Dead follows it up with one of its best episodes ever, an hour that consisted of absolutely nothing but great character moments, powerful scenes, and some genuine scares. Even though this episode continues TWD‘s new ( and wonderful) trend of having half the dialogue of previous seasons’ episodes, it seemed like so much happened. The Sick Nerd became Sick Nerd Zombie, silently creating several like-minded fellows overnight in D block, so when people wake up it’s chaos and many people are dead. Rick and the Committee figure out pretty quickly that Sick Nerd was sick, and mostly died from some kind of illness — he had no bite marks or other injuries — a discovery that would have literally taken half a season previously (cough Sofia cough no wait I’m not sick don’t kill me). Now they have a plague on their hands, but they don’t know who has it, how to fix it, or anything else. They quickly and efficiently and intelligently decide to isolate the clearly sick, including Tyreese's new girlfriend, and are trying to keep folks away from those who are potentially sick. Meanwhile, someone has been feeding the zombies by the fence, which quickly results in a zombie tsunami that threatens to knock over one of the outer perimeter fences. Rick, Glenn, Maggie, Daryl and Tyreese’s sister Sasha start busting heads through the fence, but the sheer amount of the zombies overwhelms them, and Rick tells Daryl to go get the truck. 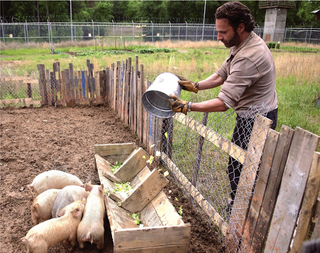 Now, I had immediately assumed Rick was just going to park the truck by the fence to help bolster it, but his solution was far smarter, and made for some fantastic and haunting TV — he rounded up his presumably sick pigs, hamstrung them, and dropped them off one-by-one to lure the zombies hordes away from the prison. It’s brutal to watch, and Rick finds it awful, but it’s also the most effective solution to the problem at hand, and given the sick last episode, Rick couldn't take the chance that they were safe..
And that’s not close to all! The magic of this new Walking Dead show is that it somehow makes us like all the characters — even the new ones. People who we’ve practically never seen before show up and are interesting and emotionally compelling, even with minimum amounts of screen time! Tyreese has a nice, subtle moment with his new gal pal, who wants to take things slow. Carol brings a dying father his two daughters to say goodbye and then, clearly compensating for the loss of Sofia, tries to teach the kids how to defend themselves, which includes trying to get two young girls to stab their just dead father in the head. And Tyreese is devastated to wake up the next morning, flowers in hand, to discover that his special lady friend and the other sick survivor have been set on fire at some point during the night and are now cosplaying as Uncle Owen and Aunt Beru. As for the characters we know — all of whom we like for possibly the first time ever: Carol talks to Carl, asking him not to tell Rick about her defense classes. Carl does tell Rick, not to be a narc, but he wants to show his dad he’s capable of trust again after his madness last season. Meanwhile, Rick is troubled because he had no gun when the zombie outbreak happened in D block, but he’s also struggling with the madness of the Ricktatorship from last season and his madness. At the end, there’s a powerful moment where he puts his sheriff’s gunbelt back on, and he gives Carl his gun back — acknowledging the problems of the past, perhaps, but willing to move past them to hopefully soldier on. And Michonne verrry reluctantly takes Baby Judith from Beth after a bit of bazooka barfing, and Michonne, after holding an infant like one might a bag full of snakes and poop, breaks down and sobs and a giant window into her pre-show life is opened. Virtually all of these scenes have minimal dialogue, if any. Think about how many foes The Walking Dead has now! There are the zombies at the gate. The plague. The dude who keeps feeding rats to the zombies and attracting them (we have to assume it’s the Governor, but something tells me that’s too obvious for new showrunner Scott Gimple). And while I thought that Tyreese’s Lass had set herself on fire after the blood starting pouring from her face holes, the “Next On” segment indicates Tyreese certainly thinks someone did this to them. Is he refusing to acknowledge the truth? Or is it the same person who’s giving the zombies rat-snacks? Every scene in “Infected” gave us new information, either about the plot or the characters. The dialogue was simple but conveyed multitudes of meaning; the scenes were all well-acted; and the show had some powerful moments and some real scares. I hate to be drinking the Kool-Aid so early in the season, but If The Walking Dead stays this good, it’ll truly be one of the best shows on TV. I know, I feel insane even writing it, but what makes me think it truly could is how easy “Infected” made it look. Like the season 4 premiere, “Infected” wasn’t all glitz or gore, but made up of genuine drama about characters we understand and suddenly root for. They have troubles within and without, and despite all their teamwork and preparation and protection, they may still be doomed. And that’s The Walking Dead I’ve always wanted to see. • I am gratified to see that Michonne also thinks she was stupid for jumping off her horse into a pile of zombies. • So many great images in the episode: The zombie feasting on the rat. Sick Nerd Zombie, slowly sitting up in the bathroom. The zombie’s head getting pushed through the fence like Play-Doh. Rick getting a faceful of pig blood. The burned bodies. • Carol is obviously overcompensating for Sofia’s fate, but I don’t know whether the show is setting us up for “Carol’s willingness to accept the harsh reality of the world will svae the day” or “Carol’s emotional scars regarding her daughter is going to put the prison’s kids in danger” but I am genuinely interested to find out. That’s a zombie-apocalypse discussion worth having. • Here’s how I know “Infected” was great TV: When Rick’s gambit with the pigs made me cringe — not just for the pigs, but for Rick. Gimple and the director did not flinch from showing what Rick had to do to draw the zombies away, and Andrew Lincoln did a fantastic job conveying Rick’s swirl of emotion — horror, determination, self-doubt, wanting to let himself crack, but forcing himself to hold it together. This is not a scene that the earlier three seasons of The Walking Dead could have pulled off at all. It would have just been Rick dropping off pigs, stone-faced, and then going back to scream at Ghost Lori some more. • Anyone else notice the extra-big “American Humane Association Certified: No Animals Were Harmed in the Making of This Episode” at the end of the credits? • What happens to Rick's hat now? Is the hat a symbol of madness and violence? Is the hat cursed?! • Zombie Tsunami. You know you want it, Syfy. Call me!